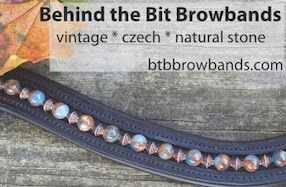 Behind the Bit: Another kind of Friesian cross -- think it'll catch on? Another kind of Friesian cross -- think it'll catch on? What job do these mules do? Driving? I would love to see one in action. If you're going to do an unusual cross like Friesian/donkey, I think you ought to say why it's a good idea and not just a "novelty cross." I couldn't find this breeder's Web page -- frustrating. Breeder(s), tell us more! well, it's the nicest mule I've ever seen. I think you secretly rather covet a mule....!!! We have a member on the Ansur saddle yahoo board with a warmblood cross mule. She is going to train her for dressage. I'd think they could excel in most any sport. But what about endurance??? I would love a warmblood cross mule, so long as he is tall, has decent gaits, and has a bit more muscle on the top of the neck than one normally sees in a mule. Beautiful trot, but...no, unless you want a sport mule! why would you want a warmblood x DONKEY when you could have a musled elegant sleek warmblood??!! I grew up with mules and quite frankly that mule is pretty awesome! A good mule is worth his/her weight in gold. As for the Endurance mules, there are already a few good ones competing. If the Fresian/mule has a decent work ethic, the cross might make an interesting therapy horse, uh, mule. Since they are advertising a matched pair, I assume they are for driving, since I can't think of another sport where they would need to be matched. My mom drives a Friesian and she loves it! 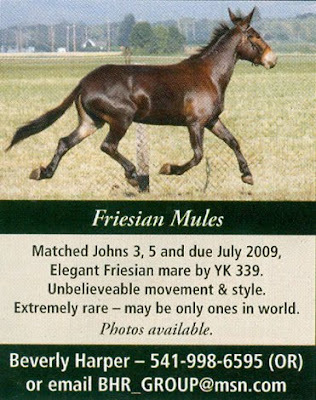 Combine the Friesian's good traits with the sense of a mule (my mom's Friesian is lovely but rather nitwitted) and I think you might have something. I can definitely see it as a great driving animal. I did not know Friesians lacked stamina, but a mule has plenty so that's a bonus. I recall reading that a Catalonian mule (Andalusian horse crossed with a catalonian donkey) was highly prized for both riding & driving. I, Fenway Bartholomule, wholeheartedly support the intentional crossing of quality mares with quality jacks. I object, however, to the chant of "rare! rare! rare!" as an argument for a breeding program. There is nothing about a Friesian that excites me except their prowess as carriage horses, and I wouldn't recommend one to my FarmWife as a dressage mount. My personal favorite Other Mule, excepting my darling girlfriend Katie Scarlett, is the honorable John Henry, a percheron cross. Google him!